Home » General Interest » What is the largest recorded explosion ? Asking this question many people might answer that it was the Hiroshima A-bomb or maybe some of the subsequent nuclear tests. However if I tell you it was actually a natural phenomenon then you might suggest Krakatoa. In fact the answer is neither. The largest recorded explosion occurred some 200 years ago and was a phenomenal 60,000 times the power of the Atom bomb dropped on Hiroshima in 1945. Monday 10th April 1815 : At dawn on the coast of the Indonesian island of Sumbawa a huge volcano named Mount Tambora stood facing the sea, rising to a height of 13,500 feet, just shorter than Mont Blanc. But in a few hours three gigantic columns of fire would rise from its crater and an apocalyptic explosion would decapitate the mountain, blasting almost 4,500 feet from its summit. This gigantic eruption, which lasted two days, would kill 12,000 people outright and leave another 50,000 to starve to death as volcanic ash stifled their crops. It was the greatest explosion in the recorded history of man, equivalent to about 60,000 Hiroshima-type atom bombs. 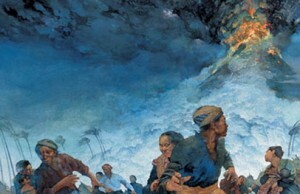 For about three years prior to this cataclysmic blast, natives could observe steam and minor eruptions coming from Tambora, and these intensified during the seven months immediately prior to 10 April. When die full eruption came, the volcano spewed out some twelve cubic miles of ash – more than twice the amount from the more famous eruption of Krakatoa 68 years later. Near the volcano, ash deposits accumulated to a depth of 90 feet, and about 200,000 square miles of sea and land (about die size of France) were covered to a depth of half an inch. The outside world first heard of the Tambora explosion literally. The sound could be detected as far as 1,000 miles away. Gradually the colossal cloud of dust and ash made its way around the world, and by late June Londoners began to observe prolonged and brilliantly coloured sunsets, orange or red on the horizon, purple or pink above it. Today you can still see what the English saw two centuries ago, as these spectacular sunsets were captured in the works of the great English painter J.M.W. Turner. Lord Byron, on the other hand, ignored the beauty and wrote a poem called ‘Darkness’ about die ash cloud’s effect in dimming the sun. A year after the eruption both North America and Europe experienced what was called ‘the year without a summer’, as cold and rain gripped the land, leading to disastrous harvests. In Paris the rainfall was three times normal. 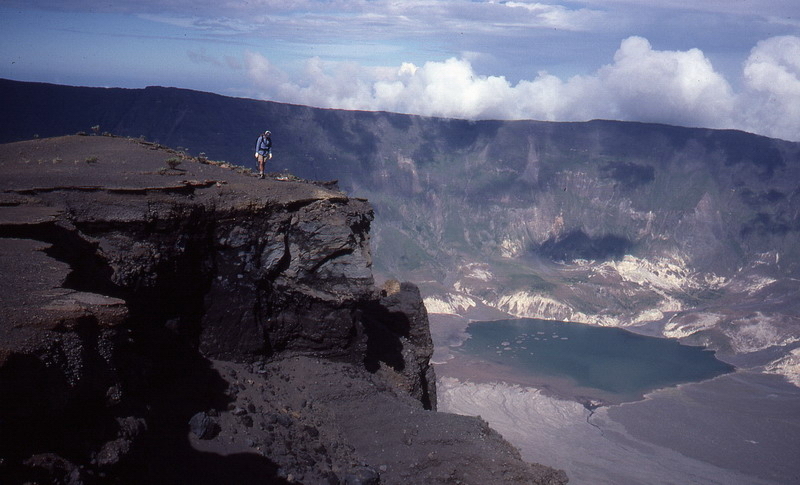 Today a vast and tranquil lake occupies Tambora’s crater, and the volcano seems to sleep. But those unwary enough to live too close should remember that Tambora erupted again in 1819, 1880 and 1967.